Take a look at this versatile cookware set! 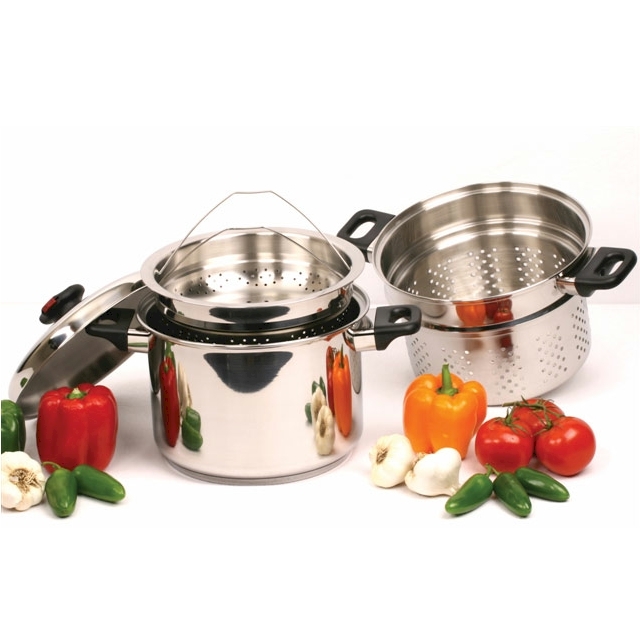 This Stainless Steel 4-Piece 8-Quart Pasta/ Steamer Cookware Set is a great choice for preparing spaghetti pasta, penne, shells, and noodles, or for steaming vegetables for a meal, or for blanching vegetables for your freezer. The surgical T304 construction is top notch for cookware. The large and small sized steamer baskets offer options in food preparation based on the quantity and type of food chosen. 9-layer stainless steel construction Creates even heat distribution throughout the cookware for achieving better cooking results. Steam valve in lid Whistles to let you know when it is time to lock the valve and lower heat, therefore, retaining nutrients and flavor. Special handle design Allow handles to remain cool to the touch during cooking. Mirror finish Retains "new" look and is at home in any kitchen.